Good mascots are hard to find. San Diego Chickens and Philly Phanatics don’t grow on trees. They require years of painstaking research and dedication before they become can part of a city’s cultural identity. So when teams like the New Orleans Pelicans change their names, the brain trust and marketing gurus behind said franchises scramble to come up with a mascot that the fans can truly get behind. A year ago, I wrote a piece about the scary, gimp-like, leather clad mascot the Brooklyn Nets had incorporated into their home games. (Perhaps they should have been more concerned with hiring a capable head coach.) This time around, I’m hosting a contest honoring the scariest bird we’ve seen since Alfred Hitchcock. Except his name is Pierre, which doesn’t exactly strike fear into the hearts of, well, anyone. I mean, when’s the last time you got bullied by a guy named Pierre? Oui Oui! Either way, Pierre is what they went with. I’d hate to see ideas left on the cutting room floor. 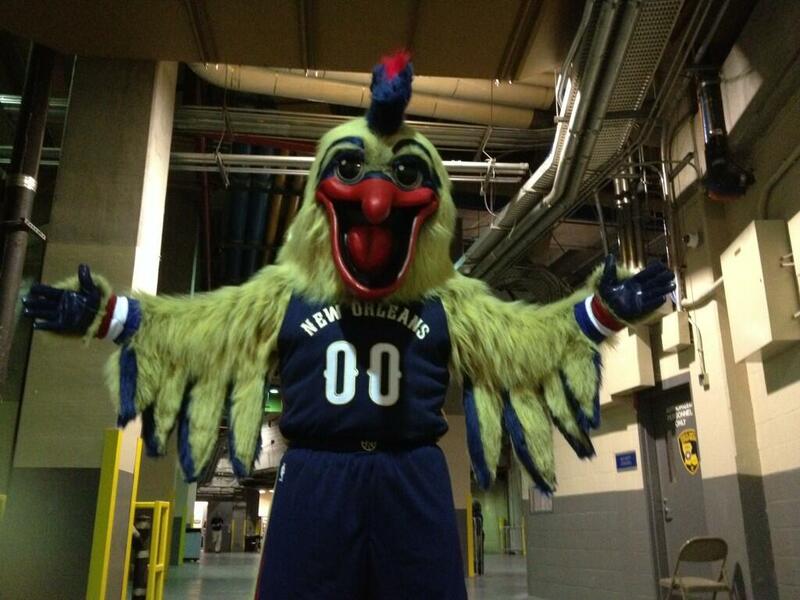 So, to welcome the NBA’s newest mascot into the mix, the reader who can come up with the best team name, or mascot name, to replace the Nawlans Pelicans, and the congenial Pierre, will receive some Mardi Gras beads (the hard way), one box of Zatarain’s jambalaya mix (to be purchased at your local supermarket) and a coupon for one free mole removal courtesy of Mr. Aaron Neville. This entry was posted in Hardwood and tagged Alfred Hitchcock, NBA, New Orleans Pelicans, Philly Phanatic, Pierre The Pelican, San Diego Chicken by Chris Humpherys. Bookmark the permalink. It’s not the Pelican that scares me it’s the fact that team believes it be a good luck charm . Based on the divisional standings , how do you believe that is now working out ? Is that what it is, Al? Then why didn’t they just call them the New Orleans rosary beads or the New Orleans Palm Readers? OMG!!! So they nixed the long beak and went with a more phallic look instead…what would Billy the Marlin say? Why did Tom Benson go out and waste $ 400 million to buy the Pelicans ? Pierre the Pelican is now following me on Twitter! You’re not suggesting the two have a ‘swordfight,’ are you? If I had $400 mil laying around the house, I’d buy myself a sports team, wouldn’t you? 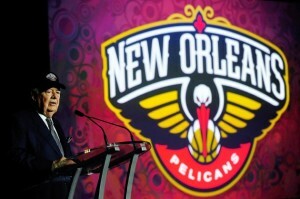 If I am buying a sport’s team it’s not going to be the Pelicans . Tom Benson is already sitting on a goldmine with the Saints . Your thoughts on the allegations concerning ‘noles’ quarterback Jameis Winston ? If true ,then the Tallahassee Police Dept has a lot to answer for if they tried to dissuade the victim from originally pressing charges and there was collusion between law enforcement and the school . How much do you believe A Rod is being charged by his lawyers per hour ? And after the player’s diatribe and actually defaming both Bud Selig and the arbitrator Fred Horowitz , I think his chances of trying have his suspension overturned is now probably mute . He should consider himself lucky this wasn’t a criminal trial as he would have found himself in contempt of court . If you can’t stand the heat, then stay the hell out of the kitchen . Don’t look now, but the Orlando Magic won’t be the only show in town in 2015. The city will be getting an MLS Soccer franchise and they will have a purpose built venue as home to that team . Problem is any other sports team is gonna cost you a lot more than half a bil. We still don’t know enough about the Winston case though, man. I want to know the nature of their relationship and how much the Tallahassee Police Department was involved in any sort of coverup. Rest assured, I’ll have my take on the A-Rod/Selig proceedings up soon. Interesting! I hadn’t heard that about Orlando’s MLS team. Where will they be building the stadium and how many will it seat? The new venue will be in the downtown area . I can tell you this , once the franchise is up and running , ,they are liklely to outstrip the Orlando Magic in terms of gate attendance for their games . The State Attorney General’s Office has ordered an investigation to the Tallahassee Police Dept’s original investigation , their handling of the criminal act , and the initial findings so far , suggest that the investigation was sloppy and unprofessional . No word by way of the school’s view on the matter and how they actually dealt with the local law enforcement agency . Jameis Winston’s family have hired a high powered attorney to represent the player and he is said to be cooperating with the parties concerning the reinvestigation . The whole matter stinks to high heaven , given the issues that FSU have had , concerning player misconduct in recent years , much of it has been covered up by the Tallahassee PD . No real difference from any other athletics’ program across the country along with the local law enforcement agencies . Miami PD and the Miami Dade Police Dept have been synonymous with that over the past decade and a half at least . You say my thoughts on A Rod concerning his walkout of the arbitration hearing . This matter will not go away at all . Now he has left his lawyers with a bag load of crap and they will have a hard time trying to disprove the league’s case after the player’s behavior prior to his abrupt departure . So the Falcons may well now be the worst team in the NFC South ? Who would’ve guessed that at the start of the season ? Only fish are afraid of pelicans. Lamest NBA name ever. Utah should take mercy on them and sell the Jazz moniker back to NO. If ever a nickname belonged in a city, that was it. Ain’t no damn jazz in Utah. I’m just sayin dat mascot getup is scarier than any clown’s 🙂 And da dirty birds covered for us last night…I still have ya in my sights and Damion’s about to school ya. They’re going to build a soccer stadium in downtown Orlando? Where exactly do they plan to put it? North of the new O-Rena? It’s not like they have tons of room down there. I’m still going to reserve judgment on the whole Winston case until the facts become more clear, which for some reason, they have not. And we’ll talk more about A-Rod in the A-Rod post I just put up. I’m not defending the guy but goodness, doesn’t the whole 211 figure seem a little arbitrary when there are already supposed to be rules set in place? Falcons the worst team in the NFC South? Not me, man. I had them winning ten games this season. NBA purists have been harping on that argument for years. Let Utah come up with a name that fits itself and give the old one back to NOLA where it belongs. Heck, Utah’s had three damn decades to come up with something original to describe their state. Or is nobody in Utah drinking enough to spark up some imagination? Furthermore, dare I say you’re suggesting the basketball franchise in New Orleans remain cursed until they get their original nickname back? How about the Voodoo or the Brass or something. I’m sure there was a good enough reason to name the team the Pelicans but if I were in that boardroom, I’d at least have to speak my mind against. I wish I could say I’m playing as much poker as I was when I was up there but I’m not and my chops are a little rusty. Or maybe that’s just what I want you to think the next time we hit the table together. Sad news with regard to the injury of the Bulls’ point guard Derrick Rose . Comes off one injury , now he tears his MCL (meniscus cruciate ligament) in the right knee, and is now out indefinitely . You should be afraid of a big, bad pelican. You know, when I was a kid… I was under a highway bridge, fishing on a walkway with one of my buddies. Out from under the walkway, after we were reeling in a good fish, a “big, bad” pelican swooped out from nowhere and ate the fish, getting caught on our fishing line. As we were trying to help this thing out, it was literally beating the crap out of us with its wings. So yeah, that’s a ridiculous story, but maybe you should be afraid of the big, bad pelican. Or maybe not. It’s a really sad story. He’s a fun player to watch. Heck, he was the youngest player ever to win an NBA MVP. Here’s hoping he comes back in full force next year. Do you remember this story? No way… yeah. I also see a Lisa Horne comment as the first one on that post. She of 6,000 Twitter followers. I remember her. Vaguely, he he.